First and foremost, chop all your veggies into small bits which include the garbage, carrot, green beans, onions, red bell pepper,green pepper, chilli, mushrooms and set aside, season your chicken and shredded beef with curry, thyme, knor cube, salt to taste and cook till its soft..when its cooked, filter the sauce out and keep it aside to be added to your white rice when cooking it. Put a clean pot on the fire, low heat preferably. add vegetable oil and allow it get hot before adding your dice onions, mushrooms, carrots, green beans, red bell pepper, green pepper, sweet corn and lastly your chop garbage. stir with a wooden spoon to mix all the ingredients together, add knor cube, thyme and salt to taste... cook for 2 mins and its all set to go. 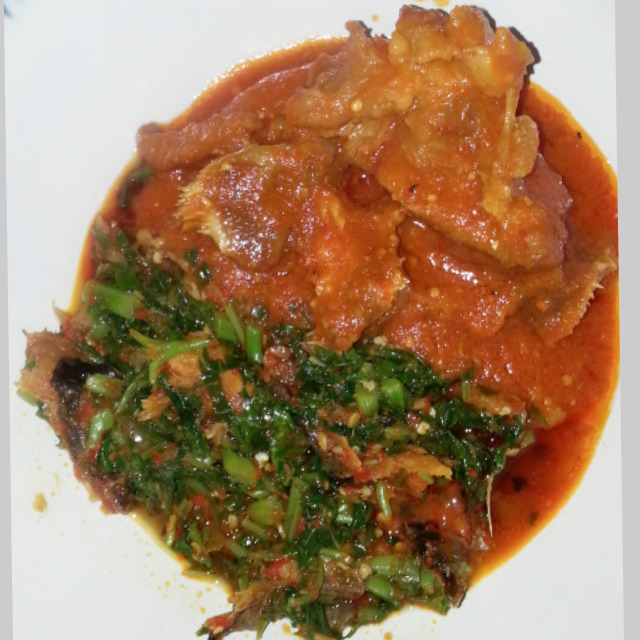 Dryfish, goat meat, cow leg, shaki, beef, Spinach leave, onions, blended tomatoes and pepper,knor cube, salt. wash your goat meat,cow leg, shaki,beef into a pot.season it with knor cube and salt to taste.cook till its soft and set aside.pot a clean pot on the fire,add your vegetable oil.when its hot add your dice onions and stir.add your blended tomatoes and pepper and cook for 3mins...ensure to stir it constantly to prevent it from getting burnt.add your already cooked assorted meats with the sauce, knor cube and salt to taste and cook it for another 3mins and its ready.For your Eforiro..Wash and chop your spinach and set it aside.blend your chilli, tatashe,onion together and set aside.add salt in hot water and soak your dry fish in it for 2 mins, wash and set aside.Pot a clean pot on the fire,add your red oil.cook it for a second and add your dice onions into it.stir and add your blended pepper into it.immediately add your washed dry fish and cover it to cook for a minute.add your chop spinach leave, knor cube and salt to taste. Mind you, no water of any sort is added as the spinach leave already has its own water to help cook it.stir and cook it for another 1 minute to retain its green look and its all ready to go. Dish out your Eforiro in the plate and your obeata by the side and enjoy it with any swallow of your choice.